The Worcester Art Museum has in its collection two Greek statues of the Orante type from Canosa, Magna Graecia, dating to the 3rd BCE. In addition, a third one from a private collection is on loan to the Museum. After a recent multi-year conservation, restoration and technical study campaign these half-life-sized statues, which have never been shown together before, will be featured in the Jeppson Idea Lab from June through November of 2013. Objects conservator Paula Artal- Isbrand is project coordinator of this exhibition. 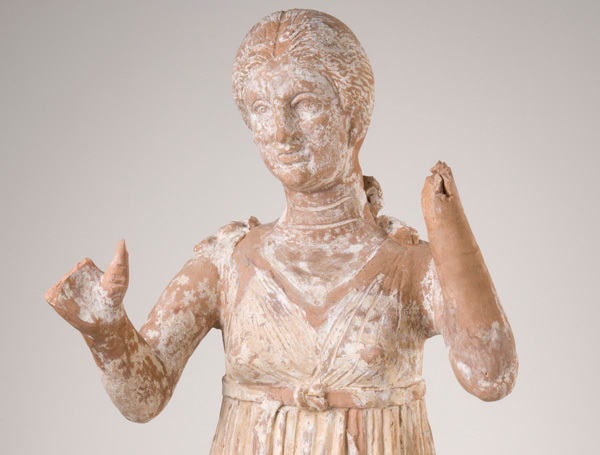 These rare statues of women in various gestures of praying or mourning were discovered arranged in small groups of four to six in ancient burial chambers in Southern Italy. Less than 100 in existence world-wide (only 9 in the USA) they have received the attention of specialists only in the last couple of decades. An exhibition of this material has never been organized anywhere. An exciting collection initiative that is being launched this season is the Jeppson Idea Lab, taking place in the Jeppson gallery located on the 3rd level and dedicated to highlighting single objects (or small groups of objects) from the permanent collection. Rather than presenting a formal thesis, which is more often the case for exhibitions, the Idea Lab will be a public forum for sharing questions about objects that may lead to future exhibitions, reattributions, or publications. Idea Lab objects are being chosen by conservators, educators, and curators. Platforms for visitors to explore ideas raised by the objects will be video interviews and iPad interactive activities with links to related materials. The Idea Lab will change every 6 months.